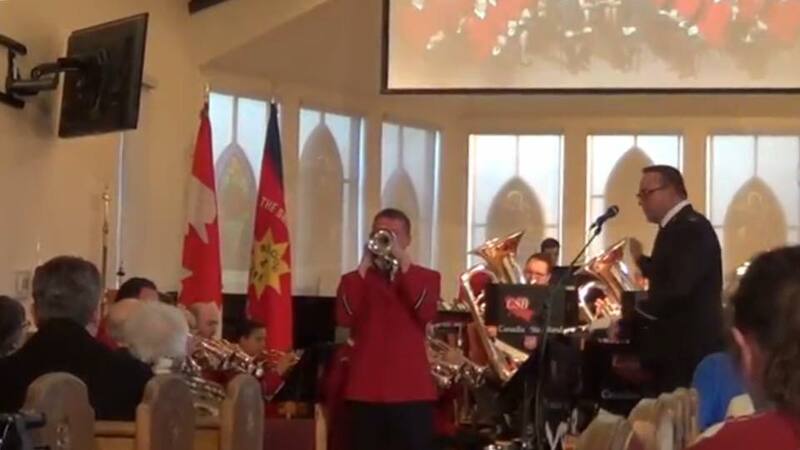 On the weekend of 1 – 2 April 2017, the Canadian Staff Band (Bandmaster John Lam) had the opportunity to fellowship and minister with two different yet similar congregations in Pickering, Ontario. At both St. Paul’s on-the-hill Anglican Church and the Salvation Army Hope Community Church, the Staff Band experienced a warm reception from wonderful people. On Saturday night at St. Paul’s on-the-hill Anglican Church the Staff Band performed a full program. Soloists included Marcus Venables (cornet) who played Beyond All Measure, Craig Lewis (trombone) who offered The Power of Your Love, and Steve Pavey (euphonium) who presented Able. Major works from the band included Laude (James Curnow), Undaunted (William Pitts), Overture – Coronation (Kevin Norbury). The latter two items will be featured on the Staff Band’s upcoming recording. The concert was a benefit to support the church’s Backpack Program, where the funds raised will directly impact the most vulnerable in their community through the gift of a fully-stocked backpack. On Sunday morning, the Staff Band was at Hope Community Church, where they were pleased to partner with all three of Hope’s worship teams, each assisting those in attendance to worship God through music. The Staff Band’s selection was Be Still (Craig Woodland), which brilliantly integrates the tune “Be Still for the Presence of the Lord” with “Still”. This article was posted in News and tagged benefit, Canadian Staff Band, concert, Craig Lewis, Hope Community Church, John Lam, Marcus Venables, Ontario, Pickering, St. Paul's on-the-hill Anglican Church, Steve Pavey, worship on 31 May 2017 .